Before you rush to buy the very popular Jensen JTA-230 turntable, it’s very important to consider its pros and cons to make sure this is the right player for you. This review will cover both but keep in mind that this is a low budget player, and as such, you shouldn’t expect to get a high-fidelity sound or great performance out of this unit. However, being such an affordable record player, this turntable may exceed your expectations. The Jensen JTA-230 is a 3-speed stereo turntable with built-in speakers and speed adjustment. I consider it an entry level record player at a very affordable price. I recommend this product to people who are on a low budget, needing something easy to use and easy to setup. This product is also appropriate for people new to vinyl or someone who needs a self-contained player. If you are not picky about sound quality, you can also use this unit to transfer your LPs to your computer in order to convert your analog music to a digital format. I don’t recommend this turntable to high-fidelity enthusiasts. As is the case with most inexpensive, compact record players, this unit comes with a ceramic cartridge, also called a piezoelectric pickup. Low end record players come with ceramic cartridges because they are robust, resistant and less expensive than magnetic pickups. Low priced turntables are generally lighter, less sturdy and less stable. This causes external vibrations to interact with the turntable. Ceramic pickups are less sensitive to extraneous noises entering the system through the pickup. This helps the flimsy units keep the external noise less noticeable during playback. If this player had a magnetic pick up, the resulting sound would probably be noisier because of external noises and the vibration produced by the built in speakers. The disadvantage of ceramic cartridges is that the stylus is more prone to go out of the groove at low frequencies. This means that the stylus may skip during playback of music with strong bass or sudden volume changes, for example in music driven by bass and drums. The skipping can be solved by placing a penny (or something of that sort) on top of the cartridge since this unit does not come with a counterbalance. However, you should be warned that extra tracking weight results in faster wear out of the stylus and your vinyl record. Another downside of piezoelectric pickups is that they don’t respond to high frequencies above 14,000 Hz. This should not be a problem for the most part, since it’s very close to the upper limit of normal hearing. The stylus that comes with this unit can play 33⅓ and 45 rpm records only. Its tip is made of diamond and has a radius of 0.7 Mil (0.0007 in). A 78 rpm record has wider and deeper grooves than those on an LP. In order to play 78 rpm records, a tip with a radius of 3 Mil (0.003 in) is needed. The stylus required to play 78 rpm records is not included with this unit, but you can buy one (793-D3) for about $15 on ebay or order directly with the distributor. I don’t recommend using the normal stylus to play the 78 records because you may damage your record and the stylus. You can expect the normal stylus to last approximately 250 hours. If you are planning to listen to your vinyl records often, I recommend getting a spare stylus from the distributor – they only cost $5. This unit is almost completely manual. It has an auto-stop feature which makes the platter stop spinning when the needle gets to the end of the record but it won’t automatically return the arm to its rest. The tonearm is made of plastic and it doesn’t have a lever to lift the tonearm, so you have to lift it manually. This may be inconvenient for somebody without a steady hand. The motor is responsible for spinning the platter. This can be accomplished in two ways: belt drive or direct drive. We use the term direct drive when the platter is directly attached to the shaft of the motor. In contrast, a belt driven platter is connected to the motor by an elastic belt. Generally, audiophile turntables have a belt driven platter while disk jockey ones are direct drive. The belt acts as a vibration damper to prevent noises generated by the motor from being picked up by the stylus. The Jensen JTA 230 turntable has a a belt driven platter and the motor supports 33⅓ , 45 and 78 RPM playing speeds. Because inexpensive turntables are not very accurate in terms of speed, a pitch control is provided to make fine adjustments to the rotation speed. The platter is smaller than normal which makes an LP stick out of the turntable. The dust cover is cut out in a way that you can close it while the player is operating. This unit comes with a spindle adapter to play 7-inch records playing at 45 rpm. This is because seven inch records have a much larger hole than LPs. The Jensen JTA 230 is a self-contained player. In other words, you don’t need any external preamplifier, amplifier or speakers for it to work. It has two stereo built in speakers located on the left and right sides of the record player. You can also use this turntable as a stereo system to connect other devices like your iPod or MP3 player through an auxiliary input jack. If you connect your MP3 player to the auxiliary input, you can play the music through the speakers of the turntable. However, it is not possible to play your MP3 player and your turntable at the same time. In order to use the turntable, there should be no cords plugged in to the auxiliary input. 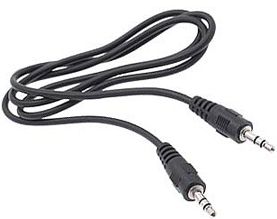 As far as the outputs, this phonograph provides left and right RCA line-out jacks, a 3.5 mm stereo headphone jack and a USB port for converting your vinyl records to digital format with your computer. A word of caution here. 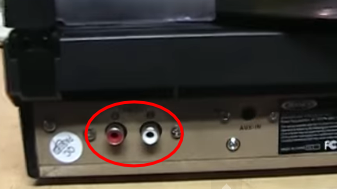 The RCA output does not produce a phono signal. If your receiver happens to have phono and line inputs, it’s better to use the line our aux because a phono signal is weaker than a line level signal. If you connect a line level signal to a phono input, the sound would be distorted. You can also connect this record player to an external speaker or receiver using the 3.5 mm output. If you connect the player directly to the external speakers make sure they are self powered otherwise you’ll also need a receiver or amplifier. You are probably interested in transferring your music to your computer. The built in USB port comes in very handy and the product includes a USB cable. The great thing is that you don’t need any special drivers for this to work. Windows will recognize the turntable as a “USB Audio Controller” and will install the appropriate drivers. Very easy to setup. In some reviews, consumers have complained about the software provided being too complicated. Audacity is a free, open source, cross-platform software for recording and editing sounds. It can be downloaded from their website. It works on Windows, Mac and Linux. This is a wonderful and powerful piece of software. I use it a lot and find it very easy to use, but if you are new to audio recording, you may experience a steep learning curve. I must say that Audacity was not developed by Jensen or Spectra. Therefore, it was not designed specifically for turntables. It’s a general purpose audio recording and editing tool. The CD is included with the product for the sole purpose of convenience to the customer and probably as a marketing strategy. It wouldn’t really make a difference not having the CD anyway, because you can always download the program for free or use your own favorite recording software. It would not be fair to rate this product based on a third party software. The recording software should not influence your buying decision. By now, you may already have a pretty good idea of the sound quality. The built-in speakers have a decent sound quality but they don’t get very loud. This is probably meant to avoid feedback coming from the speakers to the stylus and to avoid skipping caused by excessive vibration induced by the speakers. The sound does not get distorted when turning the volume all the way up, which is a good thing. The sound going out to external outputs, including the USB port, lacks in low frequencies. This could be improved with some equalization. You can also improve the sound quality by connecting the record player to an external receiver or speaker system. The effect produced by the tone control is very subtle. There are many factors that affect sound quality. One important factor is the quality of the vinyl. Many people talk about the mass of the pressed album which directly impacts the thickness of the record. The mass refers to the amount of vinyl used to press a record. Normal vinyl records are 120-140 grams. This has been the standard pressing “weight” for many years. Modern LPs are being released in 180-200 grams. These are becoming popular among audiophiles because they are supposed to produce a better sound quality. More important than the amount of vinyl is the quality of the material. A normal record is made of a mixture of “virgin” and recycled vinyl. Records that are 180 gram vinyl are generally made of high quality pure vinyl. Due to their thickness and weight, they are less prone to warping and deformation. You may be asking yourself if this turntable can play 180 gram vinyl records. Theoretically, you would have to adjust the height of the tonearm or vertical tracking angle, since the record is thicker. Ideally the tonearm should be parallel to the record during playback. There is a debate as to how much this adjustment really affects the sound quality. My opinion is that for this type of turntable, it wouldn’t make a difference, since it is not a high-fidelity turntable anyway. 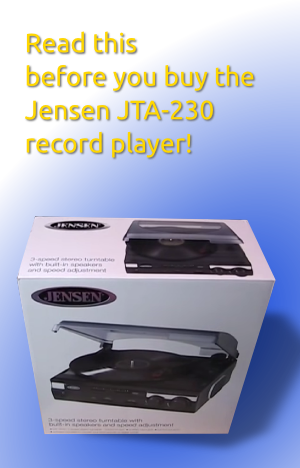 You can certainly play 180 gram vinyl records on the Jensen JTA-230. However, I wouldn’t play a limited edition 180 gram album on this record player. Instead, I would probably invest in a higher quality one. Sound quality is very subjective. It really depends on the experience and expectations of each individual. But as I stated earlier, if you are used to high-fidelity sound, then this product is not for you. But if you are used to listening to music as a background, in a noisy environment or through small portable speakers, then the turntable would probably sound OK to you. Auto Stop Switch. The auto-stop feature makes the platter stop spinning automatically when the tonearm gets to the end of the record, but it does not return the tonearm to its rest. Auto-stop should be disabled when the LP has the auto-stop area outside the preset limit of this turntable, otherwise the platter will stop spinning before the music ends. The auto-stop feature does not work well with 78 rpm records so it’s better to turn it off. Tone Control. Adjusts the treble level of the music. The effect is subtle. Pitch Control. Fine tune the playing speed of the record. Among cheap record players, this one is the only one with pitch adjust and tone control as far as I know. Speed Selector. It’s located next to the tonearm. You can select the following speeds: 33⅓ , 45 and 78 RPM. None of the parts of the Jensen JTA-230 can be upgraded. You could, perhaps, find a better stylus, but other than that, if you want a better sound quality in the future, you’ll really need to invest in a better quality turntable. The Jensen JTA-230 record player comes factory adjusted and ready to play. The only adjustment available is the pitch adjust. According to the manual, the turntable should be adjusted or repaired by qualified service personnel only. Other than placing a penny on top of the cartridge or changing the stylus, you really can’t make adjustments to this turntable. The Jensen JTA 230 is, for the most part, made of plastic. It’s small, light and has a flimsy look and feel. It has a dust cover with the sides cut out so that you can close it during playback. On the bottom it has non-skid rubber ‘feet’ to prevent the product from moving. Although feet are made from non-migrating rubber material, the manufacturer recommends to apply self adhesive felt pads to the bottom of the rubber feet to avoid damage to fine wood furniture. Here is a great video of the JTA 230 turntable in operation. In general, customers are satisfied with this product. Many people agree that the sound coming out of this unit is “tiny”, without bass and not too loud. However, the sound quality seems not to be a concern for the majority of owners. Some even enjoy this type of sound because it is similar to what most people listened to before the digital era. Many people share the opinion that this unit sounds best when connected to an external speaker system or amplifier. Considering the price, this record player has met or exceeded most consumers’ expectations. In regards to its features and characteristics, this turntable is appreciated for its weight and size which makes it convenient for storage and transportation. The ease of use and the ability to transfer your music to a computer have been valued. Some customers have complained about the software that comes with this unit but as I said before, it is a third party software and it should not influence your buying decision. My main concern with this product is that I have seen several negative reviews related to defective issues. Among some of the problems that have been reported are speed inconsistencies, skipping, humming, pitch control not working, wobbles, faulty pitch controls, defective pitch control, fast playing speed, cracking and fading speakers, power light going out and turntable not working correctly after a few weeks. In most cases, the customers received a replacement with no problems. Some others just returned the item without requesting a replacement. I know how frustrating it can be to use something for the first time and realize it doesn’t work properly. But you always have the option to return the item or ask for a replacement. The manufacturer offers a 90 day warranty. The return charges are at the manufacturer’s expense but you would be responsible for sending the item to them and the shipping costs involved. The Jensen JTA-230 consistently earns very high ratings from consumers. You need to interpret those ratings carefully, though. Most casual audiophiles looking for something affordable to get them started will love this low cost model. Serious audiophiles would be sadly disappointed. Decent sound for the price and for it’s size. No setup and adjustments required. Can be connected to a personal computer. RCA and 3.5 mm outputs. Stylus replacements available from the vendor. Good for starter or casual listening. Does not have a lever to lift the tonearm, you have to raise or lower it manually. The built in speakers are small and don’t get very loud. Low sound quality but decent for the price. Does not have automatic start-stop. Does not have a counterweight. The Jensen JTA-230 is an affordable self-contained record player recommended to people that love listening to vinyl records but can’t afford a better turntable. It’s also good for vinyl starters and people that like listening to a few records from time to time. If you don’t care much about high-fidelity sound, this player can be a great tool for transferring your vinyl albums to a digital format in an easy way. The ease of use of this product makes it perfect for someone wanting a ready to play turntable without messing with complicated setups. Considering the affordable price, this product has met, and sometimes exceeded, the expectations of customers. If you liked this review or found it helpful, please leave us a comment, we love hearing from our readers. Thank you for your review of the Jensen JTA-230 turntable. I purchased one on eBay for just over $53 (including speakers) for a particular purpose. I recently discovered a number of records that my mother had recorded during 1944-46. A few of these are music (she playing steel guitar, standard acoustic guitar, and singing with her sister and a friend) and on several she makes comments before and after the music to my father who was serving during WW2 in the Philippines and Japan. Most of these are vinyl, but 4 of them are much flimsier, made out of a cardboard or heavy construction paper type base material. They are all 78s, either 6.5″ in diameter or 8″ in diameter. I connected the turntable to my computer (Windows 8, 64 bit) but Windows does not automatically recognize the turntable as a USB device (as stated in your review as well as in the user manual). When I check the computer for devices, it does not show up, either. Can you advise, please? Also, before playing these records on this turntable, what kind of cleaner (if any) should I use to clean the records? And, is it necessary for me to purchase the diamond stylus, that you recommended in your video, before I play these albums. My main interest is in playing them one time on this turntable to record digitally in WAV format to my computer. What a wonderful story! It should be very exciting to have those records of your mom. I bet they are lovely. And the fact that the recordings have comments to your father makes those records really invaluable. I would get the Spin-Clean system which includes the cleaning fluid. For the 78s, here’s a page that explains how to clean them. Just be very careful. The USB should work on your Windows 8 computer out of the box. I would like to know the steps that you followed. So I can help you. What software are you going to use for recording? Audacity? When you connect your JTA-230 to your computer via USB, your computer should detect your turntable and install the needed drivers. Go to Control Panel > Hardware and Sound > Manage audio devices, to verify if the device has been detected. A dialog box should appear listing “USB Audio CODEC” under the playback and recording tabs. Once you start Audacity, you can select “USB Audio CODEC” for recording. As for the 78s, my advice is to buy the 793-D3 stylus. But only for the 78 records. For the vinyl records, just use the stylus that comes with your turntable. I just found your review, and it was great. I brought a Jensen about a year ago, and so far it is what I was expecting. I agree with everything you mentioned. Good review. I have a question for you: since we know that the sound volume isn´t all that great, I was wondering if this paritular model is compatible with external speakers, and if so, what kind of speakers can I get. The Jensen JTA-230 has RCA Line outputs on the back. You can connect your player to external speakers, a receiver or sound system. If you want something easy to setup I would attach a pair of computer speakers. You may want to try the Logitec Z323. These speakers are affordable and have RCA inputs. This review is great and pretty much corroborates what I’ve experienced with this device so far! I know this writing is almost a year old, but I’m having a problem after getting this turntable for Christmas last month, and I was wondering if you could offer any advice. I’m having problems with 180g records… I have to test it out by listening to some things again, but from what I’ve noticed, the pitch seems to wobble around a lot with only the 180g ones… is this something I should have expected and can do nothing about, or something I should contact the company about? They’re not limited edition so I’m not worried about the actual collectibility or sound quality/deterioration (besides the weird pitch wobble). I’ve tried messing with the pitch adjustment switch but it fluctuates so much that it doesn’t help. Any advice is much appreciated! Low end turntables don’t have accurate speeds and tend to wobble. However, it shouldn’t be too evident. Some people have better ability to notice pitch variations than others. What got my attention is that the wobble happens only with your 180g records. To me, this is an indication that the motor cannot handle heavy records like 180 grams. This shouldn’t happen, the record player should be able to play any record without pitch variations (at least not a lot). I would contact the manufacturer to get their opinion on this matter. Just let them know that the player has a hard time playing 180g records and explain them the wobbling symptom. 4. I have spent just 100$ on the record player, so, obviously i dont want to spend much on amplifier, i already have set of sony speakers (non active), can i reuse the same. I would get a pair of powered speakers or computer speakers. That is the more affordable option for you. The Logitech Z323 work very well because they have RCA inputs. Hope it helps. How do I get it serviced? cause otherwise my money including the import costs will be down the drain! Unfortunately there aren’t any local turntable manufacturers that I know of. My advice to you is to directly contact Spectra, the manufacturer. Its my first turntable purchase and ill have to say its good for beginners, The “Small” sounding audio i can fix in MAGIX Audio Cleaning Lab 2013. Theres a humming buzzing sound when i record off and on, sometimes it does, sometimes it doesn’t. Thank you very much for your input. I’ll add MAGIX Audio Cleaning Lab to my list of converting software. Hi, I just bought this today from Amazon. I was looking for a starter table for under $100 and this seemed to have pretty good reviews. What I can’t seem to find is information on whether or not this will hook up to a Bose Wave machine to use as an external speaker? Any help would be appreciated and thank you for the great write up! Sorry for the delay, I usually respond within 24 hours, but I’ve been a little busy. 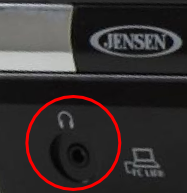 So, you need to connect your new Jensen JTA-230 to your Bose Wave. I don’t know what particular model you have but I’m assuming you have the “Bose Wave Music System III“. If not, let me know and I’ll rewrite this little explanation. The JTA-230 record player has a pair of RCA outputs and also a headphone jack as shown in the pictures. On the other hand, the Bose Wave Music System, has a 3.5 mm auxiliary input. You may need to buy one of the following cables, depending on the setup that you want to use. 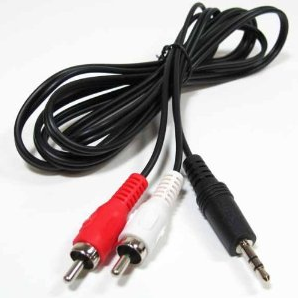 + Using a male RCA to male 3.5 mm jack adapter. + Using a cable with a 3.5 mm jack on both ends. Hi. I recently purchased this record player, and it is great. However one concern I have is replacing the stylus. I have contacted the distributor about getting one, but do you know how to go about replacing it? I have looked online but can not seem to find anything. Replacing the needle is really easy. I couldn’t find instructions for this particular model but there are many products that use the same type of needle. For example, several Crosley Turntables have a ceramic cartridge. The procedure for replacing the needle on the JTA-230 is pretty much the same as Crosley Turntables with the NP-1 needle. Go to the following link and follow the instructions for replacing the NP-1 needle. Playback position 0:30. This video is meant for Crosley turntables, but the procedure applies to the JTA-230 and other turntables with the same type of ceramic cartridge. What turntable do you recomend to me?? Between the JTA-230 and the JTA-222, I would go with the JTA-222 as it has better ratings. Both are about the same size. The only big difference between them is the USB port on the JTA-230. If you are planning on transferring your music to a computer via USB, then the JTA-230 would be your choice. If you don’t care about the computer connection, then go with the JTA-222. Good luck with your purchase and Happy birthday! 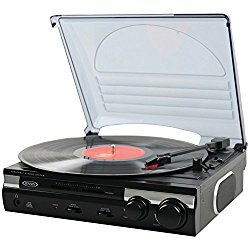 I am looking for a standalone turntable to play my old, beloved albums that I haven’t heard in years. I prefer a unit with built in speakers so I can just plug in and go. What is your best recommendation? While reading your reviews, I started to think that I’d like the AT LP 60 but then realized I’d need to plug it into external speakers, which I don’t want to do. I appreciate any input! I will be more than happy to help you choose the right turntable for you. I understand that you prefer one with built in speakers. The next thing I need to know is your budget. Based on the reviews you were reading, I’m inferring you are looking for a turntable under $100. Most turntables in this price range have a ceramic cartridge and the tracking forces are generally too heavy. Depending on the condition of your vinyl collection, a ceramic cartridge may or may not be a good option for you. If your vinyl records are in very good condition or you have records difficult to find in either digital or analog format, or if you are planning to play your records very often, then a ceramic cartridge may not be a good choice, because it will wear out your records faster. On the other hand, if you don’t care that much about the lifetime of your records and you just want to play an album from time to time, then a ceramic cartridge is just fine. It depends on how picky you are with your collection. The reason I recommend the Audio Technica LP60 is because it has a very nice magnetic cartridge that won’t damage your records. It is one of the few with a magnetic cartridge in this price range. – Crosley Collegiate CR6010A (About $120) that comes in read or blue. – Crosley Spinerette CR6016A (About $110) that also comes in read or blue. The collegiate has better ratings than the Spinerette. I personally like the Collegiate. If you don’t care about the magnetic cartridge, then cheapest turntables with built in speakers are the Jensen JTA-220, JTA-230 and JTA-222. The JTA-222 is the one with better ratings but I prefer the JTA-220 because it has larger speakers. with CD player, cassette, AM/FM radio and built in speakers. Thanks for your comment and have a wonderful day. thanks so much, Francisco! I’m realizing that I need to put this purchase onto the backburner right now but definitely will revisit when I can treat myself. Will be in touch! Bought a second hand at-lp60 per your recommendation. I love it. Sounds so good. I’ve really have needed vinyl back in my life, for a long time now. The only other question I think I have is, can I buy a better needle for this player? I’m so happy for you! I’m glad you could get a second hand one. I think that is the best way to get a better quality turntable at lower price. I know, it’s nice to be able to play vinyls again. Great feeling. The replacement needle for the AT-LP60 is the ATN3600L. You should consider replacing the old one that came with yours because you don’t know how many hours it has. There’s another option. At LP GEAR, they sell an upgrade kit for the AT-LP60. It’s a conical stylus diamond stylus ATN3600DLXI. Just search for “Upgrade Kit for Audio-Technica AT-LP60 turntable”. So, you have pretty much those two options, the ATN3600L and ATN3600DLXI. Hope it helps and enjoy your music! Actually the pitch issue is still there. Ok now its working fine. No problems at all. And I am baffled. Great to hear that everything is working fine. I think you did the right thing. The belt can give you pitch problems some times, it may be telling you that is time to replace it. The upgrade kit I told you about comes with a nice belt. Just in case you have problems again. Feel free to contact me any time. It doesn’t bother me, on the contrary, I love helping. Keep me updated on your AT-LP60. I am straddling the area between, budget and sound quality. Do you have a recommendation? One that offers highfi, but make a limited budget breath a sigh of relief? I would go with the Audio-Technica AT-LP60. This unit has a good sound quality and it’s fully automatic. I’m not sure what your budget is but turntables under $100 don’t really have a good sound quality. The Audio-Technica AT-LP60 has a Dual-Magnet phono cartridge which sounds fairly good. You could also get the Audio-Technica AT-LP60-USB for a higher price. It’s just the same model but it has a USB connection for digitizing your vinyls. The downside is that the AT-LP60 does not play 78 rmp records, it doesn’t have adjustment features like counterweight and anti-skate and can’t really be upgraded except for the stylus. I don’t think that would be a problem for you if you were considering the Jensen JTA-230 which doesn’t have those advanced features either. I hope that helps. If you need anything else I’ll be more than happy to help you. If you give me more information about what you are looking for, I can help you find the best product for you.